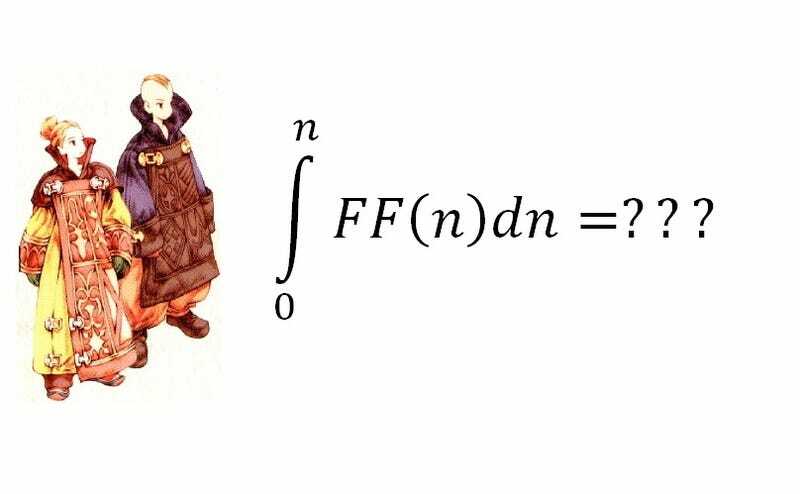 The following is an attempt to scientifically analyze how efficiently each entry of the Final Fantasy series uses its opening moments to pull in the player by: showing off its unique world, establishing the tone of the game, demonstrating its gameplay mechanics, or how many moogles show up in it. Information was extracted by random Youtube videos for inconsistency and the amount of time used was determined by the game’s number in the series for reasons I am keeping to myself (ex. Final Fantasy X is judged by its first 10 minutes). Obviously, there are many, many, problems with this approach, but cut me some slack, I’m not a videogame scientist, I’m just a bad one. So, without further ado, let’s jump into this random encounter! The Curve: The first game in the series begins with your party on the world map and impressive amount of freedom. You can choose to do almost anything really. And then our 1 minute runs out. Analysis: Immediately upon selecting your party, you are dropped into the world of Final Fantasy with no instruction whatsoever. If you choose to spend your precious minute walking north, you find yourself in Castle Cornelia, where you begin to learn about a kidnapped princess and a rogue knight. If you decided to walk east or west, you would find yourself in the town, where you can buy supplies or equipment. If you decided to walk into in any other direction you could find yourself in a random encounter, where you can fairly easily teach yourself how to fight. You could also spend some time in the menu, familiarizing yourself with where everything is. The first minute of Final Fantasy I grants you the freedom to do almost whatever you want and teaches the player everything they need to know about one specific element of the game in that minute. There is, unfortunately, no time to do anything else. Still, the open-ended nature of this opening is very true to the spirit of this adventure: Go wherever you want and see what happens. Result: 4 out 4 white mages say this introduction would totally work! Gotta keep that hope alive. The Curve: The second game in the series begins with a battle that you embarrassingly lose, at which point you are rescued and brought to your starting location. From here, you gain control of your characters, allowing you to talk to NPCs and even learn a keyword, or you can just chill out in your menu. And then our 2 minutes run out. Analysis: The game gives you a good look at the combat system, as well as establishes just how powerful the bad guy in this game is with an army that wipes you out. You’re essentially a part of the main conflict of the game right away, effectively making you a participant of the story. It’s really up to you to decide if you want to invest time to continue forward and get revenge on those jerks that messed you up so early on. What this intro doesn’t show the player very well is how the level/strength up system works, since you lose the only battle you get in these first 2 minutes. Although, it really doesn’t matter at that point in the game, because a new player is probably living in the blissful ignorance that level ups work the same as any other game, so it should have no impact on how they feel 2 minutes in. Result: 4 out of 10 party members probably died thinking this introduction needed some work. The Curve: The third game in the series begins with our hero (heroes, if you’re playing the NES version that never made it stateside) falling into a hole, fighting his way through some trouble, and then finding a strange rock. And then our 3 minutes run out. Analysis: Much like the last game, you are led for most of the introduction, but with slightly more input in terms of combat. In 3 minutes, you get more than one taste of combat, giving you time to explore how fighting works (and making you sad that you can’t use the “magic” command). After the initial battle, you are free to move about the cave, though your options are limited to short paths and a strange looking rock. You could also spend your time rummaging about your menu to familiarize yourself with that. The game does very little (nothing, actually) with the larger story, but it does project the spirit of a humble beginning to a fun adventure. Though nothing really happens in these 3 minutes, there is just enough curiosity for what comes next that there isn’t really a good reason to just stop playing. Result: 1 out of 4 light warriors think it’s a great start! The other 3 wish they had screen time here. Note: From here on, our mathematical model seems to generate well-defined constants, or unique characters if you will. Most intriguing behavior. So proud of you, standing your ground like that! The Curve: The fourth game in the series begins in the sky with Captain Cecil and his Red Wings. They struggle with harming innocents for the greater good as Cecil flashes back to when they did just that, attacking magicians to retrieve a crystal. Suddenly, they get attacked by monsters, which Cecil defeats with ease. Then Cecil meets his king to turn over the crystal he took from the village. And then our 4 minutes run out. Analysis: This introduction does much in just 4 minutes to establish the story. It introduces you to the hero, Cecil, and highlights his struggle to honor his king and follow his moral code, a core component of his journey to light side of the force. The game also introduces the crystal and hints at its importance to the overall conflict. These 4 minutes are well-spent setting up a grand tale that it delivers on. But some of those 4 minutes are spent on showing off the battle system too. Depending on which version of the game you fired up, you either get to watch the battle unfold (SNES version) or you get the chance to sample it yourself to learn how to fight and what Cecil’s Dark Knight command does (varies from version to version). Result: 4 out of 4 fiends say this is a worthy entrance. The Curve: The fifth game in the series begins on top of a castle. A king tells the princess that something is “wrong with the wind” and flies off to see what can be done. From there we see multiple individuals: a pirate notices that the wind has died, an old man hurries into action, and the princess notices the wind as well and hurries off in search of her father, despite his instruction to her not to follow him. Next, we see a man in the woods with his birdlike companion, when suddenly, a meteorite lands nearby and they go investigate. He finds two goblins carrying the princess and he springs into action. And then our 5 minutes run out. Analysis: These first 5 minutes are primarily focused on the story, giving us glimpses of important characters and providing a strange, yet ominous threat: the disappearance of the wind and a meteorite that crashes nearby. We don’t get to see what the full impact is, but it conjures up enough mystery to keep the player intrigued. The game actually manages to show us quite a bit of our heroes’ personalities in these minutes too. The princess runs off to help her father despite him telling her not too, putting her compassion for others on full display. The man in the woods is given no context for why he is there, but we can infer that he is a traveler by the makeshift fire he is using and by how he rides his companion to the crash site like a horse. He moves about with ease and doesn’t hesitate to fly into battle to rescue a person in trouble. We learn all this before we even find out his name. There is just enough time in this introduction to engage in a first battle, which is straightforward enough. There are blanks in the command list to suggest that the combat system will evolve somewhere down the line, but there is not nearly enough evidence to show how complex we know it becomes. Result: 2 out of 2 worlds would like to have a go with this! Perhaps they could go at the same time. The Curve: The sixth game in the series begins with some images of locations with text explaining the world’s history: a terrible war, the disappearance of magic, the emergence and reign of high technology, and the revival of magic for destruction. We then see 2 soldiers in mechanical suits talk about a town they’re about to enter to find an “esper” from the war 1000 years ago and how the girl with them, while powerful, is completely under their control. They all march through the snow toward the town. Once there, they engage in combat with town guards as they make their way to the esper. And then our 6 minutes run out. Analysis: The first 6 minutes are jam-packed with story setup. They establish what the world looks like, most notably the extinction of magic. The story about the war also serves to setup the motivation for the soldiers, to retrieve the “esper” which remained from the war 1000 years ago. They also wonder if it’s still alive, which makes whatever it is seem more mysterious. From the intro text, it can be implied that whoever is trying to revive magic is doing it for nefarious purposes. Combined with the fact that they have enslaved someone, shows that this group is part of “the bad guys”. Battle mechanics get a brief demonstration once we reach the town; menus within menus to select attacks and items, which is pretty intuitive and simple. These fights are somewhat misleading since magitek abilities make up a very small percentage of fights in the game, but it presents a clear picture of what the essence of fighting looks like. We don’t learn too much about the characters from these minutes, only that the girl is very powerful and the X-Wing pilots soldiers think of her as a tool, not a person. The fact that she possesses magical abilities tells us that she is unique in this world, and the way she effortlessly destroys opponents without remorse shows she is completely under their control. Interestingly enough, a good amount of her story can be read from the slow march to the town. The walk is cold and barren, the song that plays: sad, but powerful. The entire scene is hauntingly beautiful, and sets the tone for her journey and the rest of the game. Result: 12 out of 14 heroes would heed the call to storm the enemy ranks. Don’t yawn, he’s talking about important stuff! The Curve: The seventh game in the series begins with shining lights in the dark. The face of a woman emerges and walks down an alley, camera moving outward, to reveal a giant city in the dark, and then the title of our game. A train pulls into its stop and people suddenly jump out to rough up the guards on the platform. A spiky-haired man flips down from the train. Our hero has arrived. Moving forward, he engages in combat, swinging a large sword to easily cut through his opponents. When he joins the rest of the team he makes it clear that he’s not here to make small talk or introductions, just a paycheck. Moving forward, the man in charge shares that they’re on this mission to save the planet from the jerks sucking it dry of “mako”. Again, the hero brushes it off and moves forward with the job. And then our 7 minutes run out. Analysis: The first 7 minutes strike a fair balance between story exposition and gameplay. After a brief look at the world you’ll be exploring, you’re thrown straight into the action. The combat is intuitive and easy to grasp without a tutorial spelling it out for you, while also merely hinting at the expansion of your command options. Between battles, you’re treated to background and motivation for you and the characters around you, which also tells us much about their personalities and the roles they play in the story. From the start, we can see that Cloud is an exceptionally talented man, from the large sword he brandishes with ease to how the team speaks about how impressive his past looks on a resume. Yet, from his reactions, we can see that he is detached, unwilling to empathize with the group and not sharing their passion to save the planet. He makes it known that he’s only there for the money, like your typical cool action hero. Barret, the only other character you can name, is presented as the group’s leader. From the way he speaks, he comes off as loud and short-fused, but it is clear that he cares about the task at hand, saving the planet one reactor at a time. This introduction starts with a bang and doesn’t let up for the whole 7 minutes, gearing the player up for what will undoubtedly be an intense and thrilling ride. Result: 7 out of 8 sectors raise their heads to sky hoping to see more. School work, am I right? The Curve: The eighth game in the series begins with waves gently crashing on a shore. The camera begins to pick up speed as we see the text of a conversation fade in and out. The scenery changes to a girl standing in a field of flowers, and as a feather floats into the sky, a sword goes spinning towards the ground. The blade is taken by a man in black as he engages with another swordsman. As they fight, we get glimpses of seemingly random scenes and people, which go unexplained. Just as the fight heats up, the man in black is knocked back by a blast of fire and the other swordsman slashes him across the face, which he returns in kind. Afterwards, we see him waking up in an infirmary bed being chastised by a doctor and we learn our swordsman’s name, Squall. The doctor leaves and a girl greets Squall, only to leave immediately and mysteriously. Next, Squall’s instructor, Quistis, comes to pick him up and walks him to class, where she then tells everyone about a field exam taking place later that day. And then our 8 minutes run out. Analysis: The first 8 minutes are completely devoted to establishing the setting, tone, and characters for the story. We are introduced to the school our hero attends and its lighthearted tone, from the music and bright colors. It stands in direct contrast to our hero, Squall, who seems cold and distant. The opening cinematic tells us nothing of the larger story, but hints toward a more personal tale, beginning with the conversation and then the training session that gets personal. Despite what favors the introduction does for the game’s background, it is unable to deliver in demonstrating what its gameplay mechanics are like. Throughout the entirety of the first 8 minutes, there is no combat whatsoever, not even a peek at what it should look like. There isn’t really much more to say about this. Final Fantasy VIII has some of the most confusing combat systems in the series, and none of it is shown here. In summary, we’re not sure what this game is about or how it plays, but there is no doubt that it’ll be a dramatic ride. Result: 3 out of 16 GF critics accuse this of witchcraft. I didn’t want it to end either! The Curve: The ninth game in the series begins in a thunderstorm, as 2 passengers on a small boat are rocked by the waves. Suddenly, a young woman wakes up, the storm having been a dream, or perhaps a memory, and looks out from her castle window into the sky, where we see an airship break through the clouds. Inside the ship, a man with a curious tail slides down a ladder and enters a dark room. He lights the lamp and greets his friends, when suddenly, a dragon-man leaps forth and attacks them! After the battle, their leader, who was wearing a dragon mask, gathers them into the meeting room, where they discuss their plan to kidnap the most babe-ilicious beauty of Alexandria kingdom, the princess, by staging a play for the whole kingdom. We transition from the skies to the streets, as we meet a young lad with a big hat wandering through town and bumping into rat kids. He makes his way to a stand in the middle of town and presents his ticket to see the play, only to discover that it’s a fake. And then our 9 minutes run out. Analysis: The first nine minutes are a master stroke of brilliance that manages to introduce us to our heroes, bring us right into the plot, set the mood for the game, and throws us right into our first taste of battle. Not only does it do all these things, but it does them in a way that is informative without dragging, as well as feeling familiar but fresh. Let’s begin by looking at the battle the game throws at you a few minutes into it. Right off the bat, it shows you how big your party can be, with 4 members, and what your command options are: attack, steal, and item (as well as a “skill” command for Zidane). What is especially well-designed about this encounter is that your team consists 4 people that can steal, hammering the point home for the player that this is something they should really use. It encourages the player to try it out, and if we follow through with that, we’ll be treated to a powerful weapon early on for Zidane, a lesson the player should remember moving forward. Using steal also teaches us that there is a limit to the number of items held by an enemy. Another thing this battle solidifies is the fact that Zidane is a main character, from how the player could choose his name to the fact that he’s the only one with a 4th command in “Skill”. The game teaches and shows all this about its battle mechanics in only about 1.5 minutes. The introduction focuses on 3 characters: Zidane, the boy, and the princess (identified by her placement in the castle, as well as the doll the thieves use in their planning). We learn that Zidane is a thief, though he comes off as an easy-going person, rather than ruthless and cold, like we picture most thieves. His position as main character defies our expectations for a hero by having us root for a person in a less than noble profession (It’s one of the ways this game spins old stories to make something very new). We learn about the boy we meet in town that he has an innocent and naïve nature by how he apologizes to the rat kid and his inability to see that his ticket is an obvious fake. Finally, we learn little about the princess, except that even though she is royalty and her birthday is being celebrated by a whole continent, she isn’t happy. Her mind seems troubled by something. It could have something to do with her dream or it could be something else. We don’t know for sure what it is, but there is something there beneath the surface. This introduction begins dark and dramatic, transitions into goofy and light-hearted, and then shows off something sweet and adorable. It’s a roller coaster that is more informative than you expect, twisting and turning upside down in a way you’ve never experienced. We don’t know where this story could possibly go, but it’s going to be charming, bittersweet, and beautiful ride. Result: 27 out of 27 Mognet letters would be about how good this intro was. Not even a scratch after that fall! The Curve: The tenth game in the series begins with a quiet scene at campground, where a number of nameless faces have gathered for a heavy moment. One man, blond haired and asymmetrically dressed, steps forward to speak directly to you, the player: “Listen to my story…” From there, the scene shifts to a thriving city under the night sky with a crowd of people eagerly anticipating their celebrity. Our hero enters the scene and starts greeting the crowd. After that, he heads out and we hear a voice talking about a local hero that disappeared. Your character approaches the arena, getting swarmed by a crowd in the progress, and then the games begin. The arena flashes to life with music, floating water, and roaring spectators. The underwater game continues until suddenly they city is attacked by a large creature hidden under a wave. The hero falls from the arena into the rubble below. And then our 10 minutes run out. Analysis: The first ten minutes are wholly devoted to establishing the tone of the game and introducing us to the hero. There is a reason the opening scene is so well-known: right from the start, the game tells you that this will be a dramatic and emotional tale. The music is slow and somber, while the characters appear to be contemplative and our hero even makes a direct plea to you, the player, to please take their story to heart. The second part of the intro brings us to Zanarkand, which is an impressive looking city, but really it is there to help characterize the hero. He’s an athlete and celebrity living in a big city. He’s on top of the world up until the last minute, where we see that his world is being literally turned upside down. The 2 parts work well to set up the rest of the game: it’s going to be heavy and there are going to be twists. One thing these 10 minutes is missing though are some random encounters. Unless you speed through most of the intro, it’s unlikely that you’ll see any fighting in that time. We’re not introduced to any additional gameplay mechanics other than walking and talking to NPCs, but aren’t we interested in learning more about what’s to come at this point? In summary, in 10 minutes we don’t see much of how the game plays or find out anything about the larger story, but we get a good taste of what our journey will be like: super dramatic and full of great music. Result: 4 out of 6 guardians would stay to the end of the story. The legacy version. Was that you? The Curve: The fourteenth game in the series begins just like the eleventh. Analysis: There are simply too many results to make one comprehensive analysis of these first minutes. And that is all that really needs to be said about them. Result: Millions out of millions have and will tell their own tales in these minutes. I’m sure you have a long and fruitful life ahead of you, Reks. The Curve: The twelfth game in the series begins with a wedding celebration! Immediately after, a vicious battle breaks out. Our heroes are defeated, a life is lost, and what began as a celebration of new life, ends with a funeral. From there, a narrator tells of the larger conflict between two empires and how a small kingdom was lost in the fires of war. Finally, you wake up through the eyes of our hero, Reks, fighter for the Kingdom of Dalmasca. He talks about how his little brother is all he has left and his captain remarks how he’s too young to be forced to fight in a war. Enemy soldiers attack and the captain swiftly disables all of them. We gain control of Reks as he makes his way to the rest of the team. And then our 12 minutes run out. Analysis: The first 12 minutes are used to establish the political background of the game’s story and assuring you that it will not be a light-hearted romp through the park, but rather a dramatic roller coaster ride. It begins on a bright and optimistic scene and quickly escalates into a grim scene. In the span of 6 minutes we get to witness both a wedding and a funeral. The narrator does an excellent job describing the political climate in the game world, and how the tensions between two empires have caused strife for the home of our heroes. The last scene with Reks and the captain drives it all home: this is serious. Unfortunately, the 12 minutes fall short of the first battles in the game, so we are unable to see just how much the gameplay has changed between the last iteration of the series. We are however, treated to what the HUD looks like: a mini map in one corner, and character status in another. This tells us that it’s important to know what’s going on at all times, even outside of combat. Perhaps combat can occur at any moment? This is a strong introduction for the story and some characters, one that sets to the tone for what’s to come, although we don’t get a firsthand try at the fighting. It tells you that you’re going to need to pay attention to what’s to come because you’ll probably need to think about your next move and the story’s development. Result: 1 out of 2 brothers would kill to see what happens next. The Curve: The thirteenth game in the series begins on a train filled with armed soldiers escorting hooded individuals lined up along the sides. Suddenly, one of them steps forward and begins engaging the soldiers. After a very intense action sequence featuring guns, flips, rockets, defiance of gravity, our two heroes come face to face with a mechanical monster. The tutorial battle begins and finishes without much difficulty and the two continue forward. As they push on, they encounter more hostiles, and this repeats for some time. And then our 13 minutes run out. Analysis: The first 13 minutes are packed with action from start to finish. Within moments, we’re introduced to our heroes, guns blazing and gun blading. The heroine is the one with the impressive combat skills, skillful taking down multiple soldiers on the train, and rockets to blast the flying pursuers. Then about half way through, we got our first battle, followed by several others. It demonstrates that this will be a fast-paced game, with quick battles and many back-to-back. As far as the story goes, we don’t learn much, only that the heroine is a former soldier and that these two are working together to stop “The Purge”. There seems to be other spots of conflict shown in this intro, but whether they are related remains to be seen. We don’t have much of a hint about what the overall plot is about, only that there will be much fighting and that there are many mysteries to this world to figure out, such as what Purge and L’Cie mean. Overall, this is a strong introduction that tries its hardest not to bore the player and draw them right into action. It shows plenty of exciting moments, and opportunities to get a feel for the combat system. It also gives us a glimpse of what our 2 characters are like. We don’t get to learn much about the world, and the introduction doesn’t seem to encourage much exploring, so we’ll just have to wait and see if the game opens up a bit as we go along. Result: 5 out of 6 L’Cie want to charge forward with their focus. So, there we have it, 14 data points in a series which forms a curve unlike any other, using a completely arbitrary evaluation technique. In conclusion, this mathematical model proves to be an unreliable way to gauge the rest of the game at each point, nor can it effectively evaluate what future data points will look like. All we can really say about Final Fantasy, is that it cannot be defined by just one person or one set of metrics. It is defined by you, the fan, and however long you choose to live in these worlds. I for one, hope to be analyzing this series well into my old age! Here’s to hoping the first 60 minutes of Final Fantasy LX will be unforgettable! Thanks for sticking with me through this! I hope you can at least pretend for me that it was just a little bit informative ;) I don’t have XV yet, but if you do, please feel free to share about your first 15 minutes! PSA: The Mortal Kombat movie is back on Netflix!